Following a teaser posted on Twitter early Friday, the Realme 3 Pro has been spotted on Geekbench, revealing a couple of new details about the upcoming phone. For starters, we didn’t previously anticipate the Realme 3 Pro to have a high-end chipset. But the phone had already been teased to be capable of running the Fortnite Mobile game at 60 frames per second. The Geekbench results revealed a Snapdragon 710 CPU paired with 6GB of RAM. 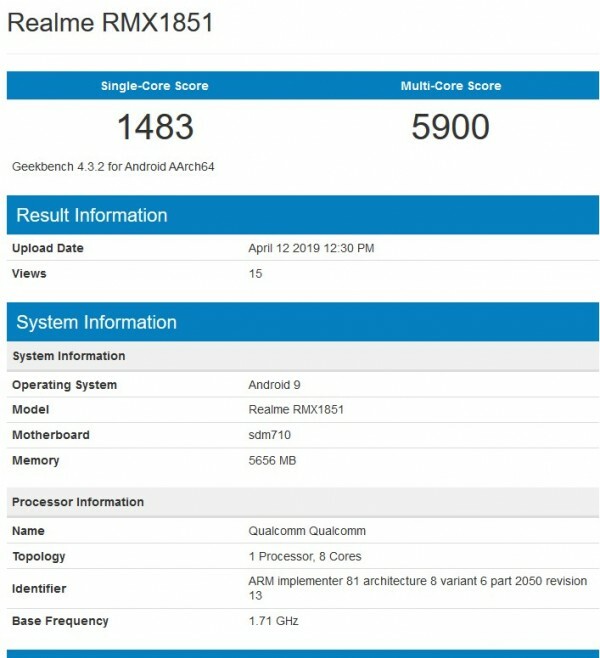 Not only has the phone been spotted on Geekbench, but the same “RMX1851” listed on Geekbench has an entry with the Bluetooth SIG revealing more specifications. According to the listing. The Realme 3 Pro will have a 6.3-inch FHD+ display. There’s also a fingerprint scanner, Bluetooth 5.0, 5GHz Wi-Fi, and the battery’s capacity is rated for 3,960 mAh. The listing also mentions Color OS version 6.0, which indicates the phone will come with Android 9 Pie out of the box. Thanks to an earlier teaser with camera samples, we can gather that the Realme 3 Pro will have a selfie camera somewhere above 12MP but also below 25MP. Meanwhile, the main camera is believed to be a dual camera, one of which is a 48MP snapper with some kind of secondary snapper. The phone is directly marketed to compete against the Redmi Note 7 Pro, which has a 48MP + 5MP setup. The Realme 3 Pro is going to be announced on April 22 at a press event at Delhi University in India. Stay tuned then to hear all about the Realme 3 Pro. Pricing hasn’t yet been revealed, but we’d imagine it’ll be comparable to the Redmi Note 7 Pro’s. True, but if processor is massively under clocked then other benefits are mute and one should opt for SD675. 'If' CPU is not under clocked then SD710 is a slightly better deal due to GPU and power efficiency.